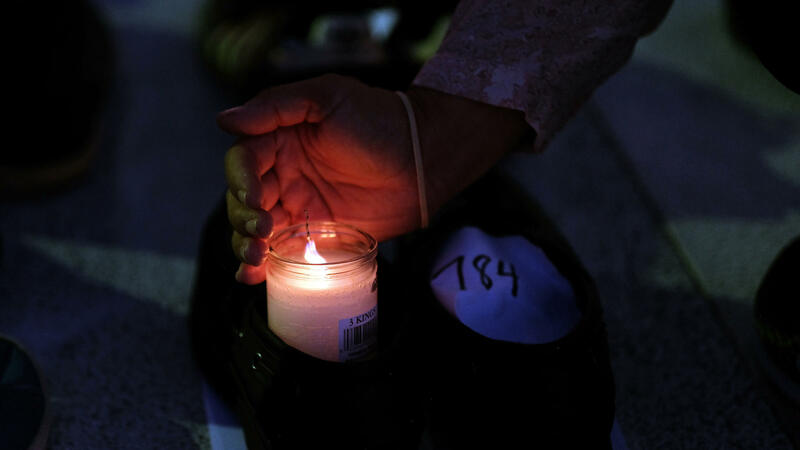 A woman lights a candle inside a pair of shoes that were among hundreds displayed in memory of those killed by Hurricane Maria in front of the Puerto Rican Capitol, in San Juan in June. Puerto Rico's governor updated the island's official death toll for victims of Hurricane Maria on Tuesday, hours after independent researchers from George Washington University released a study estimating the hurricane caused 2,975 deaths in the six months following the storm. The researchers' findings had been long-awaited. Puerto Rico Gov. Ricardo Rosselló commissioned the independent study in February, after months of public pressure over his administration's failure to adequately count the number of hurricane dead. At the time he commissioned the study, the governor said the research team would have the Puerto Rican government's full cooperation, including access to all mortality data. As a result of Maria, researchers estimate 22 percent more people died during the six months after the storm than would have had the hurricane not struck. They also said those most likely to have died were poor people and the elderly. "The results of our epidemiological study suggest that, tragically, Hurricane Maria led to a large number of excess deaths throughout the island," Carlos Santos-Burgoa, the study's lead researcher, said in a statement. "We hope this report and its recommendations will help build the island's resilience and pave the way toward a plan that will protect all sectors of society in times of natural disasters." Since December, the government's official hurricane death toll has been stuck at 64, though the government has acknowledged that number was likely far too low and would be adjusted once the researchers had completed their study. In addition to their new death count estimate, researchers found that the Puerto Rican government did a poor job communicating with the public about the death count — and more broadly did not have an adequate disaster communications plan in place, which the researchers said contributed to public confusion. According to interviews, researchers found that many health and forensics officials on the island also were uninformed about how to document hurricane-related deaths. Speaking to reporters in San Juan on Tuesday, the governor acknowledged he'd made mistakes. "This could have been done differently," Rossello said. "I recognize all that,"
In the absence of a rigorous effort by Puerto Rico's government to count its dead in the weeks and months after the storm, several media outlets and outside researchers worked to arrive at their own figures. Most recently, Harvard University researchers published a study that estimated the number of hurricane-related deaths likely ranged from about 800 to 8,500. That study had a wide margin of error because it was based on household surveys. In addition to updating the island's official death count Tuesday, the governor said he had created a commission to look into how his government could execute a number of recommendations the study's authors made for handling a death count after future disasters. And he said he had begun speaking to architects at the University of Puerto Rico about designing a memorial honoring the dead. The George Washington University researchers said their findings are more accurate because they are based on access to government mortality data and death certificates, and account other variables, including the number of people believed to have left Puerto Rico after the hurricane. Two thousand, nine hundred and seventy-five - that's the estimated number of people who died because of Hurricane Maria in the first six months after the storm struck Puerto Rico. This new death toll was released today, nearly a year after the storm. It comes from a new independent study commissioned by Puerto Rico's government. NPR's Adrian Florido has been following this story for months and joins us now. Hi, Adrian. ADRIAN FLORIDO, BYLINE: Hi, Ari. SHAPIRO: There have been a lot of different estimates of how many people died. What makes this new one significant? FLORIDO: Well, this is a study that was commissioned by Puerto Rico's own government. If you remember shortly after the storm, the government started getting a lot of criticism for not taking its death count seriously - beginning with that famous visit from President Trump, when he touted that there'd only been 16 deaths certified. Puerto Rico's government stopped counting at 64. And a lot of media outlets and other researchers started trying to arrive at their own numbers. And so this issue kept getting more and more controversial. And finally in February, Puerto Rico's Governor Ricardo Rossello announced that he would ask researchers from George Washington University to start looking into it and arrive at their own number. And that's when they started working on this study that they released today. SHAPIRO: To jump from 16 to 64 to nearly 3,000 is really striking, how did researchers get to this new number? FLORIDO: Well, they analyzed government data. They reviewed death certificates and the government's death registry for that six-month period after the storm. And then using statistical modeling, they compared that six-month period to previous six-month periods in previous years. And while many more people obviously died in the six months after the hurricane, that number 2,975 is the number that they say - they estimate died because of the storm. SHAPIRO: And what does this research say about the groups of people who are most affected by the hurricane? FLORIDO: Well, researchers found that every part of the island was affected. But the people who were most affected were old people and poor people. What is still not clear to researchers is which of those nearly 3,000 deaths were caused directly by the storm - so for example, someone drowning, or a tree falling or an accident - and which were indirect deaths - so for example, a diabetic person whose insulin might have gone bad because the power was out - right? -and then died as a result of the complications. And the researchers hope to get those answers - those more granular details in a second phase of the study that they hope to start soon. SHAPIRO: Adrian, you've been living in Puerto Rico for most of the last year reporting on the aftermath of the hurricane. Explain how the government there got these initial numbers just so very wrong. FLORIDO: Well, it's just very clear that they mishandled this at many steps in the process in the death count. And that's one of the things that this report found - that many officials, for example, on the island who are responsible for recording deaths and issuing death certificates, had not even been properly informed on how to report disaster-related deaths. And so it was hard to come up with a tally. The study also said that the government had done a poor job of communicating with the public about the death count. And that ended up actually causing a lot of confusion. So the researchers made a number of recommendations in their report aimed at improving the government's response in the future. SHAPIRO: What has the reaction today been from Puerto Rico's governor? FLORIDO: So he spoke earlier today at the governor's mansion in San Juan and acknowledged that his government had made mistakes in its handling of the death count. And he also significantly said that he is going to adopt this new number 2,975 as the government's official death toll estimate for Hurricane Maria. On top of that, he said that he was going to create a commission to review the report's recommendations and to work to execute them. And then finally, Ari, the governor said that he had begun speaking to architects at the University of Puerto Rico to design a memorial for the hurricane dead, which is something that a lot of people on the island have wanted because they've said that not even having a number and not even knowing how many people had died from the storm had made it really hard to fully grieve them and remember them. SHAPIRO: That's NPR's Adrian Florido. Thanks, Adrian. (SOUNDBITE OF THE COUP SONG, "OYAHYTT") Transcript provided by NPR, Copyright NPR.